Home » Review » Kill Cliff Recovery Drink Review: What’s this drink all about? Recovery drinks aren't that common. Not nearly as common as energy drinks which have swarmed the market a couple of decades ago. However, there's a new kid on the block that aims to change all that. A great tasting drink with a plethora of aromas available that aims to bring recovery ingredients to the drinks' market... So, let's see what's it all about! We’ve all been to the gym at least once or have overworked ourselves physically. Most of us also know the feeling in the muscles the day after (hint: lifting a glass of water is like lifting a dumbbell). When you do a more physical activity than usual, your muscles work overtime. And, then recovery time begins. During this time (which starts about 2 hours after you’ve completed your workout and lasts for 2 days), your body starts repairing damaged muscle fibers. Mind you, this damage is microscopic, but it still needs to be fixed… and that's what aim to cover in this Kill Cliff review! This is where the well-known feeling of muscle soreness begins (otherwise called DOMS). So, if you work out for a long time without pausing, the soreness will be worse. The issue arises when you want to continue training but can’t due to this feeling (and the reparation of fibers). Regular gym-goers and professional bodybuilders always use something to aid recovery time. And that’s exactly what we’re going to be talking about here – the Kill Cliff Recovery Drink; a recovery method that has recently become quite popular. It’s a relatively new drink, which might seem insane considering it’s a drink, but the creators of Kill Cliff managed to achieve success. The main purpose of this product is to improve the recovery time so you can continue your training faster. It’s time we take a deep look into this product and see if it’s worth your money. Welcome to the Kill Cliff review! Kill Cliff Review | Ingredients – Anything Worth Mentioning? All products of this type require the perfect blend of ingredients to be the best. Some are amazing, some are terrible, so unless you receive some tips or read some info yourself, you might end up with the ‘trial-and-error’ process. The thing is, there’s no need for this. Everyone is perfectly capable of finding info themselves, but this time, we’re giving you a shortcut. 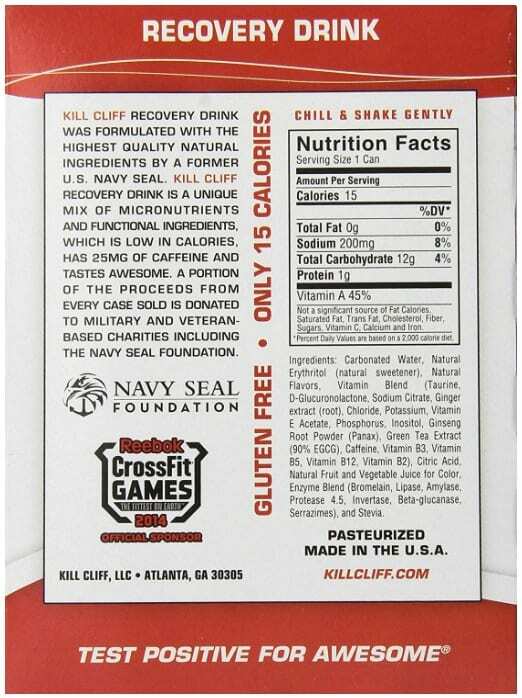 So, what ingredients does the Kill Cliff Recovery Drink contain and what are they used for? Let’s find out! One interesting and very important piece of information you can learn by looking at this ingredient tab – this product was created with the veterans and military in mind. Some of the proceeds go to foundations and charities related to the army. As such, the product itself is of high-quality with extreme attention to detail. Inositol is an interesting choice for an ingredient but we can see why they would go for it. Inositol is used to treat a couple of health issues such as high blood pressure, high levels of testosterone, and high triglycerides. High levels of testosterone are problematic when you’ve completed your workout session and just want to recover and relax – you can’t. Because of this, Kill Cliff Recovery Drink is an effective recovery time boost. This ingredient is a big part of this product due to how it affects the human body. It’s an acid that plays an important role in keeping you healthy. It also affects your body shape in a positive way. Basically, when you’re working out and pushing yourself, your body reforms itself ever so slowly. If there’s a higher intake of glucuronic acid, your body will better be at doing this. Vitamin E Acetate helps with the skin and acts as an antioxidant. Increasing your intake of antioxidants will aid inflammation reduction and help with recovery times. All in all, this product contains ingredients which work perfectly together. It is clear that the company which creates this product makes it with a lot of care and effort. Kill Cliff Side Effects | Should You Be Worried? Kill Cliff Recovery Drink doesn’t have any side effects unless you push it too much. What I mean by this is that, if you drink too much of it, you might end up with a couple of these side effects – itching, red eyes, constipation, vomiting, diarrhea, nausea (the latter 4 are more serious cases and they happen less often). These side effects can happen because of too much phosphorus; an ingredient present in the Kill Cliff Recovery Drink. However, if you drink the amount you should, you won’t experience any side effects. Reviews are an important part of understanding any product, which is why you should always consider them when purchasing. Of course, there are reviews which are blatant lies, but finding this out isn’t too difficult. 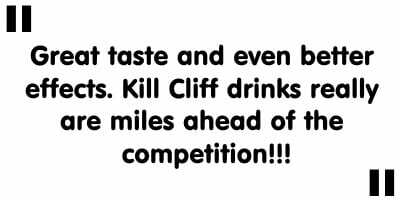 Anyway, we found a couple of reviews about the Kill Cliff Recovery Drink which might interest you. They basically confirm what we already know (judging by the ingredient list and what the ingredients are supposed to do). When we take a wide look at this product and attempt to see what its purpose is, what do we see? Well, we see that it’s a great product that was created by some amazing people with honorable and dedicated goals in mind. There’s no doubt that this isn’t some makeshift attempt at a recovery aid; this is a planned path from beginning to end. And, it is beautiful. I have no doubt in my mind that those reading this who end up purchasing the product will agree with this assessment and opinion. What are your thoughts on Kill Cliff review? Tell us all about it in the comment section below! Kill Cliff Review | Where to buy Kill Cliff? If this product is what you’re looking for and it interests you, take a look at the official Amazon listing for more info. You’ll find some other stuff which could also be helpful! In this case, it’s the aptly named blood orange. The product contains natural fruits which gives it a huge advantage in my book. Lots of vitamins and healthy stuff! Caffeine is primarily used as a CNS (Central Nervous System) Stimulant. It’s also used to treat drowsiness, migraines, and headaches. Gives more energy and stability, helpful when working out and exercising. Constipation occurs due to feces becoming too hard and being unable to pass. 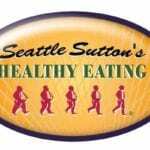 If it lasts long enough, serious gastrointestinal damage may occur. It is noted that if you go 2-3 days without going to the bathroom (and feel bloated), you should visit the doctor. Constipation can be caused by a plethora of reasons. In this case, too much phosphorus might be the cause. In general, it doesn’t happen very often and when it does, you’ll find out how to fix it. How Much Does Kill Cliff Recovery Drink Cost? As you could've read above in the Kill Cliff Review section, this recovery drink doesn’t cost a lot and it’s very affordable. The 12-pack costs $28.99 but the real deal is the 24-pack which is $55.99. In the end, one 24-pack will last you a long time. Yes, there have been numerous reviews confirming what we found out about this product. All of the ingredients featured are great and effective, so it definitely does what is advertised. There are no effective alternatives to this product so I'm afraid you'll have to work with it. You can purchase a pack of the Kill Cliff Recovery Drink directly via Amazon. Recovery PM Review: Finest Solution for Natural Sleep and Recovery?